Summer is always a fun time for me to try new things. This is because I'm not working, so I have plenty of time on my hands, plus I tend to feel more creative and inspired. Trying new things often includes going to new areas to try new restaurants and explore new places but it also means trying new styles in my wardrobe that I might not feel so free to experiment with because I am more focused on "professional" attire during the school year. 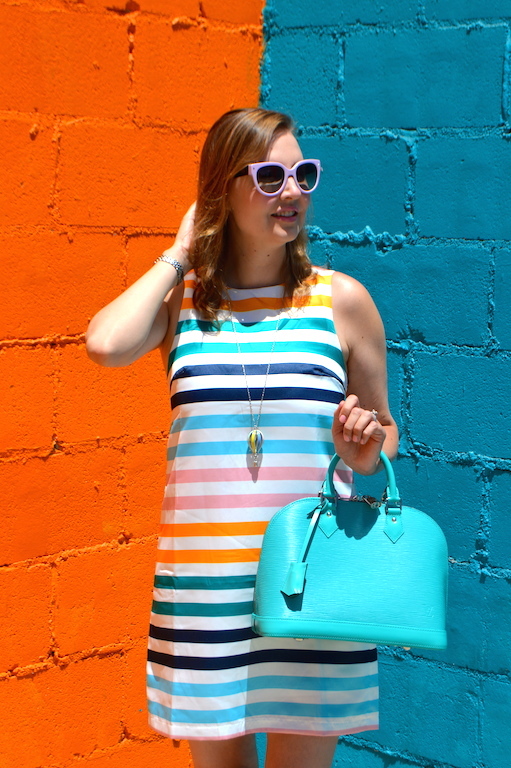 This adorable striped shift dress is definitely not something I would wear to work, but it is absolutely perfect for a hot summer day of strolling through a new area, going to a new restaurant and discovering a new location. Originally, I wanted to wear this dress to stroll along the beach and pier in Santa Monica, which is on my "summer to do list". Unfortunately, one of the freeways was closed due to roadwork this weekend, so Santa Monica was completely out of the question. (I'll save that adventure for another day when the traffic isn't so crazy!) 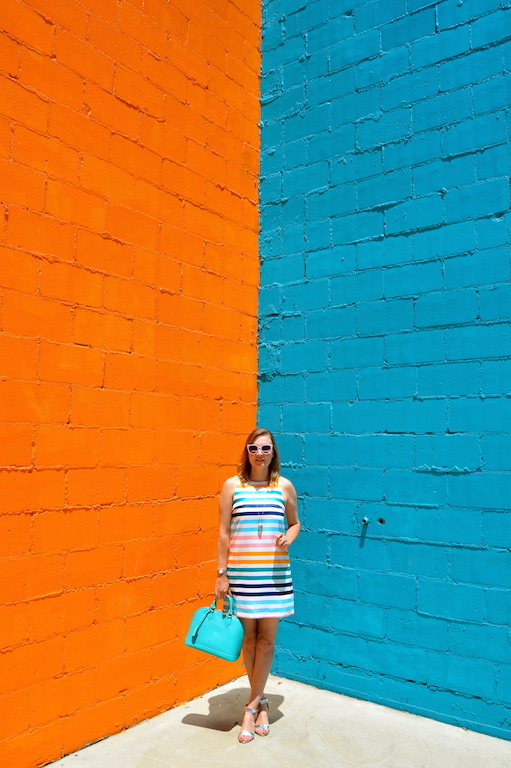 Luckily, I found these adjoining blue and orange walls that matched my dress perfectly. 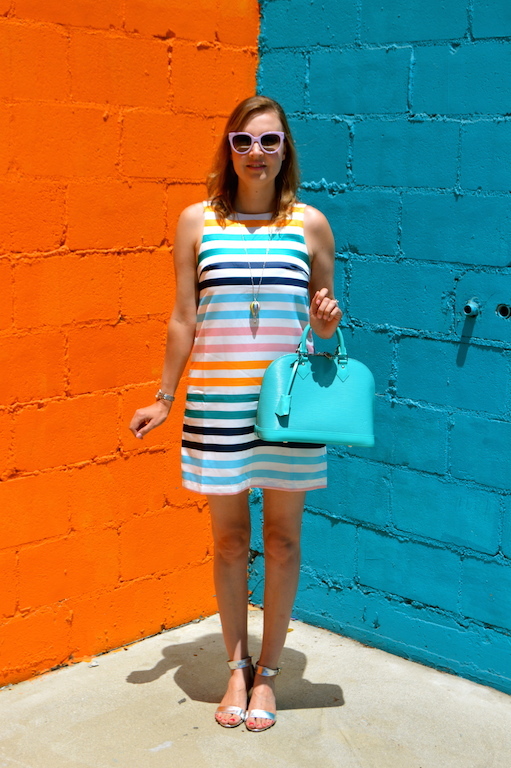 Like the color scheme of the stripes on my dress, they "shift" from orange to blue! I love the colors of this dress. They remind me of candy! The walls look great with it. Obsessed with that dress and bag! Thanks for linking up with the Trend Spin Linkup! This dress!!! So cute! I wanted to buy the top version of this but now I'm convinced to get the dress! What a cute dress and I love the walls you took the pics in front of - well styled! Adore the dress and love the unique back drop as always. You find the best places to take photos! I'd love to see you share this look on my Midweek Inspo Linkup! That dress is so cute! I love the background, too! 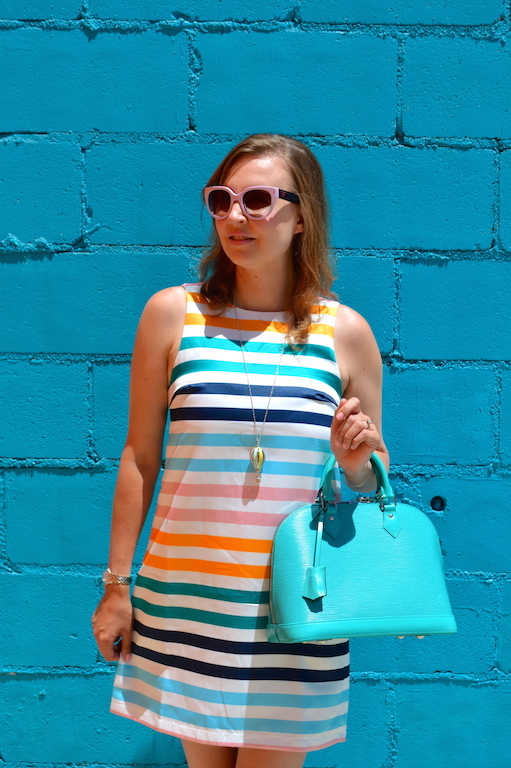 Hehe I liked your shift pun :) That is the perfect summer dress, I love all the different colored stripes, and it really does go perfectly with the walls! I love your striped rainbow shift and that gorgeous balloon necklace which matches it perfectly. Also, you chose the perfect colored wall for this dress. Gorgeous dress!! Amazingly perfect background!! I feel like this is the perfect reason to wear a dress---it's fun, you don't have to think much about what else to pair with it and it looks terrific! Such a super fun, cheerful dress and the absolutely perfect backdrop to shoot it against. Neither of those colours is overly common (in most places at least) for walls, so to find them together is a real treat for sure. I adore this fun stripe dress and driving in LA is never fun. I drive a lot for work and always have to rely on Waze to help me maneuver through traffic.